British traditions in Australia have had, for many decades now, a fierce Australian-ness to them. Take our names, for instance. Most of those Australians with British ancestry have a British name, but we tend to rampantly turn them into diminutives: David is Davo, John is Johnno, Shane is Shazza. For that matter, breakfast is brekky, barbecue is barbie, afternoon is arvo. And then there’s our flag, which is basically the Union Jack with the The Southern Cross stuck on the corner. So it should come as no surprise that a competition involving dressing up in Victorian period costume and dunking biscuits into tea, a seemingly necessarily British activity, should incorporate a great Aussie bikkie* in the antipodean version. Or, in this case, several varieties of the same great Australian biscuit. You see, back in the Victorian era, William Arnott, a Scottish immigrant to Australia, set up a bakery in New South Wales. (Even our place names are an Australianised Britain.) His sons continued to run this bakery in New South Wales, until amalgamations and acquisitions of interstate bakeries in the 1960s led to the national company. Then, disaster! The four bakeries, running out of different states, all using different recipes for Ginger Nut Biscuits, trialled baking them to the New South Wales standard. Non-New-South-Welshmen protested vigorously, and Arnott’s decided to maintain the four recipes, even when baking them in a single bakery and giving them identical packaging (apart from nutritional information). So now in Queensland, Ginger Nuts are thin and sweet, with a dark colour. In New South Wales they are small, thick and hard, with a light colour. In Victoria and Tasmania, they are bigger, softer and sweeter. While in South and Western Australia, the biscuits look similar to their Victorian cousins, but taste sweeter. 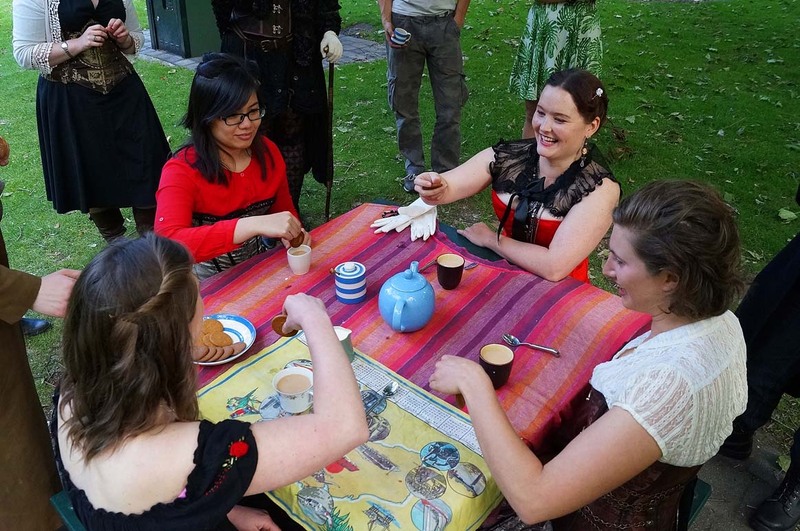 On this particular occasion, being the first known Tasmanian Tea Duelling tournament, we had only managed to supply the Queensland and Tasmanian/Victorian versions of the biscuit. The tournament was ostensibly held in honour of the quarter century celebration of the year 1989: the year of the Second Edition of the Oxford English Dictionary, the fall of the Berlin Wall and – coincidentally – my birth year. Thus we had gathered a group of discerning gentlefolk in their best Steampunk attire at the Cascade Gardens, below the impressive colonial façade of the Cascade Brewery. We set up the picnic tables with tablecloths, laid out home-made baked goods, fired up the hiking stoves, and brewed ourselves a good Australian Breakfast tea with Ashgrove milk. Then, the challengers stepped forward. Tea Duelling is a brilliant sport that I’d seen played at the Lincoln Steampunk Festival in England a few months previous, so I’d decided to import it to the colonies. None of us had ever played before, but we were so eager that we decided to play four people off against each other in the first round. Eyeing each other off, and under my command, the challengers added Ashgrove Milk (or not), sugar (or not), and chose from amongst the mix of Queensland and Tasmanian Ginger Nuts. Then, it was time to dunk. The result of this great Antipodean Tea Duelling Ginger Nut experiment? To be honest, we did not actually keep enough record to scientifically state the superior Tea Duelling variety of Ginger Nut. However, you can cheer yourself up by reading an excellent review of the teeth-breaking strength of the New South Wales Ginger Nut in this blog. And you can further console yourself with the knowledge that Antipodean Gingernut Tea Duelling shall continue, until a Superior Tea Duelling Ginger Nut† has been determined. *Bikkie and bikky are acceptable abbreviations of biscuit, but since Arnott’s themselves use bikkie I’ve adopted that here. †Though we all already know that the Victorian/Tasmanian variety is the superior biscuit per se. In my research on the history of Arnott’s, I also discovered a quiz answering what your biscuit preference says about your personality.